Organizations are turning to leverage big data and analytics to ‘look’ for indicators of intent or indicators of compromise, thus helping organizations focus their security resources on the threats at hand. The challenge though is how to process the vast amount of data, and furthermore, keep it relevant, timely, actionable – contextual. The challenge becomes harder when threat actors utilize a variety of techniques to maintain anonymity, reduce their ‘fingerprint’ and mask their intent. In this webinar, John Ellis, Akamai’s Chief Strategist for Cyber Security (APJ) will share how Akamai leverages the vast amount of data that it sees daily to help its customers improve their security decisions, when the threat would otherwise be unclear. John will showcase how Akamai’s big data and analytics platform, Cloud Security Intelligence, powers its Client Reputation service. A service that provides the ability to forecast intent and protect applications against Distributed Denial of Service (DDoS) and application layer attacks, and how active defence can be applied to a variety of response mechanisms, delivering an intelligent contextually aware defence. Join Akamai and (ISC)² on Aug 17 (Wednesday) at 2:00p.m. 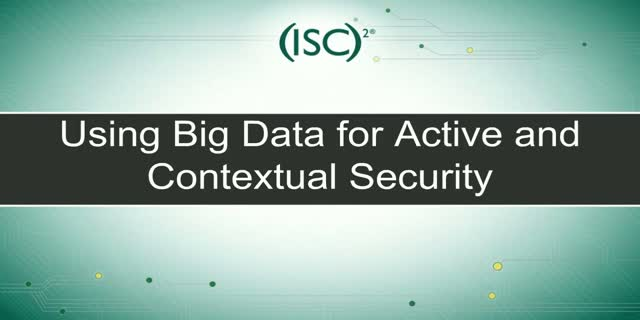 (Singapore time) for a Security Briefing on how to use Big Data for active and contextual security.